This morning, as I sat with my head bowed in prayer, I thought about our upcoming Holy Days. I thought of family and presents and the birth of our Savior. I thought of how, as a people, we are so easily distracted from the shining light of truth and quick to cleave to worldly fancies, forgetting the source of our very breath. This morning, as I sat with my head bowed in prayer, my mind was filled with heady thoughts. During the Christmas season, we attempt to encourage ourselves to remember the "Reason for the Season". We talk about celebrating "Jesus' Birthday" and read the account of His birth in an attempt not to get caught up in the spectacle that has become "Christmas". We sing Christmas carols, bake cookies and give each other gifts, all while expressing our desire to emulate the greatest gift. But, when all is said and done, we feel let down - like we are missing something. Something big. Truth be told, Christmas, along with all of our holidays is celebrated with food and family and friends. And that is right and good. Every one of the holy days of the bible were celebrated similarly. They all centered around God's children (family) and feasting. The feasts were a time of remembrance. God instituted celebrations as an opportunity for His children to perpetually remember what He had done. Christmas in our modern time is no different. It is a time to remember the Savior, that is God, who became man in order to bring perfect reconciliation between sinful mankind and a holy, blameless God. And we celebrate as in times of old, with fellowship and feasting. As wonderful as Christmas is, it is all too often overshadowed by strife and discord. We are consumed with finding that "perfect" present, baking cookies for every person we have ever met and decorating our homes to look like a spread in a glossy magazine. And then, when the day actually arrives, we feel nothing but dread. The family is coming. Uncle Fred is difficult, Aunt Fran smells. And then there's the drama of Aunt Martha. She and her family always arrive late and grumpy, her children are sullen, her husband is contentious and she is always mad at someone in the family. It is so bad that the other brothers and sisters take bets before she gets there as to who she will be mad at this year. In reality, Christmas would be perfect if it weren't for the people. They are a burden and serve little purpose but to ruin the "Norman Rockwell" image we have so carefully crafted in our minds. And therein lies the problem. We are so set on celebrating a "perfect" Christmas, trying to keep Jesus at the center, that we miss our true calling - one of sacrifice and humility. Sitting in church this morning, the picture of a perfect Christmas played before my eyes. It had nothing to do with snow or trees or presents. There were no carolers or elves or jolly red men. There was nothing but a humble room, twelve men and a soul intent on doing the will of His father. 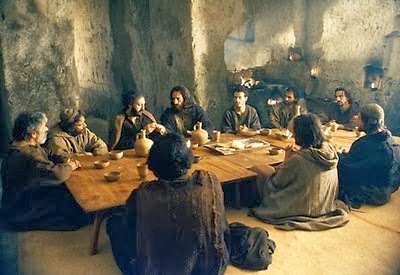 Jesus, during his own last supper, revealed to us the perfect keeping of the feast. He gathered his family (the twelve) together, for an afternoon of fellowship and feasting. He prepared a feast for those he loved. He ate and drank with them. He shared his soul. He even knelt on the floor before each man, removed his sandals and washed his feet, giving to him a perfect gift. He did this with full joy mingled with heavy resignation. He celebrated this feast with his imperfect family, knowing it to be his last feast on earth. He broke bread with the man He knew would betray him for 30 pieces of silver. He drank from the cup of the man that He knew would deny him three times. He gave perfect gifts to a family that would betray and disown him. He knew it - and he served them anyway. His was the perfect feast - the perfect Christmas. As you gather together to celebrate our Lord, remember who it is that you are serving. You are serving the One who kissed his betrayer on the cheek. You are serving the One who loved the man who would deny Him. Can you do any less for the family He has given to you? This year, celebrate the true meaning of Christmas. Forget the "Norman Rockwell" vision of Christmas and embrace the "Upper Room". Love those that persecute you, serve those that revile you, kiss those that betray you. Merry Christmas to you all. I pray that your "Norman Rockwell" Christmas is replaced with the "Upper Room" Christmas and that God reveals His perfect Gift to every last one of you. True Christians celebrate "christmas" and "easter" every SUNDAY.. True Christians celebrate Christ EVERY DAY! I was wondering, where in GODs word does it say to celebrate christmas? Are we not supposed to make things up like this? God bless you friend. We are all lead to do things for our families and our lord. “Put Christ back into Christmas” is now a well-worn cliché. Sincere people tell us that a Christian should observe “the church calendar” such as Christmas and Easter in a Christian way rather than the commercial way of the world. The problem is that this overlooks a preliminary question; are these festivals right at all? There can be no Christian way of doing what is wrong in itself. There is no Christian way of robbing banks or vandalizing bus shelters, so we cannot speak of the right spirit with which to observe these things unless they are legitimate to begin with. There was no right way to worship the golden calf, even though Aaron called it “a feast to the Lord” (Exodus 32/5). So where did these festivals come from? The Bible knows nothing of Christmas and the only reference to Easter (Acts 12/4 A.V.) is a translation of a word that is simply rendered 'passover' in many other places. The origin of Christmas seems to lie in the pagan festival of Saturnalia which in turn goes back to the supposed birth date of Tammuz (Ezek. 8/14) the sun-god. Saturnalia was abhorrent to Christians until around 300 A.D. when the roman church endeavored to change the pagan festival into a Christian one claiming that it was to mark the birth of Christ, albeit he was not born on 25th December. Many of the original pagan customs remained however, and are still practiced to this day. Very interesting. The Old Testament has GOD angry at Israel for constantly disobeying him by getting involved with the false religions of the peoples around them and worshiping idols. It seems to be the reoccurring theme. Ive never thought of xmas in that way..
We are not supposed to worship false idols. But nowhere in my Bible does it condemn a thankful celebration of the precious gift of Christ that was given by our Father in heaven. I would say that the validity of this Christmas celebration lies not in the date or in the world's reasons, but would have to be determined by the purpose for the celebration in one's heart. If you are able to judge another person's hart, then you have truly been given a gift. Nowhere in the Bible does it say Christians should be somber. We should be joyful in celebrating the wonderful gift that has been given to us! I would suggest that Christmas and Easter is not often enough to celebrate. Perhaps we should hold monthly or bi-monthly feasts to remind ourselves and others of the goodness of our Savior and Father! The very fact that the Bible does not teach the observance of Christmas or Easter should be enough for us to avoid it. In the Old Testament, when God told the people of Israel exactly how to worship him, including the special days they were to observe, he also said, “what thing soever I command you, observe to do it; thou shalt not add thereto, nor diminish from it”. (Deut. 12/32 cf Lev. 10/1-2) In the New Testament Christ taught the same thing: - “In vain do they worship me, teaching for doctrines the commandments of men. For laying aside the commandment of God, ye hold the tradition of men” (Mark 7/7-8). The Apostle Paul also warns against “will worship” (Col. 2/22-23), that is worship that originates in what man wants to do rather than what God requires him to do. We may like to say to others, “you worship God your way, I’ll worship him mine”, but God actually requires us to worship him neither your way nor my way, but his way. The “church calendar” was never appointed by God. This scriptural teaching that whatever Scripture does not warrant is to be excluded from worship is known as the "regulative principle”. The exclusion of the church calendar, uninspired hymns, musical instruments, vestments and unscriptural ceremonies as well as more modern encroachments such as drama and dance, all stand on this same principle. Acceptance of this principle is a mark of a good Church. But you ask, does this mean that Christians are not free to worship God any day? No, this is not what I am saying. The New Testament church did meet on other days for worship than the weekly Lord’s Day appointed by God. And certainly we may observe special times of prayer and thanksgiving as circumstances would suggest. To respond appropriately to special providences is entirely legitimate (e.g. Acts 4/24 and 12/5). “ Nevertheless, it is lawful and necessary, upon special emergent occasions, to separate a day or days for public fasting or thanksgiving, as the several eminent and extraordinary dispensations of God’s providence shall administer cause and opportunity to his people” (Westminster Directory For Public Worship), but the same document states, “festival days, vulgarly called ‘Holy-days’, having no warrant in the Word of God, are not to be continued”. Providential circumstances vary, the facts of redemption accomplished do not. The facts of redemption to be specifically commemorated are the Lord’s death and resurrection through the Lord’s Supper and the Lord’s Day respectively. No legitimate addition can be made to these Divine ordinances and so Christmas, Easter, etc. should be entirely rejected by the people of God. Merry Christmas To You and Yours Enola. Our Christmas is with family, celebrating Jesus, and helping those in need. Now that was a refreshing article! Love the statement, "embrace the Upper Room". We don't celebrate mas in any form but I totally understand if anyone celebrates the Dec 25 mas. if they honor our LORD. We do celebrate the biblical Holy Days. How you described celebrating, "gathering and having the soul intent on doing the will of the Father." is beautiful and right. May GOD bless you and your household according to His loving kindness! Thank you for this - it truly helps me with being able to explain how I've been feeling. Thank you for your fine article! Thanks to the shedding of Jesus' blood on the cross, we can have a true relationship with God. I will strive to remember that as I celebrate the Upper Room with friends this season! I SO needed this. Well said and Thank you. May you and your family have a blessed Christmas. Beautiful image of the last supper. Humbling, inspiring article. Blessings to you all. Merry Christmas to your family from Indiana. May God bless you in 2014. We love you guys. Merry Christmas! our family used this article as our Christmas eve devotional before taking the Lord's Supper. Thank you for putting our feelings into words. Have a blessed 2014 and keep writing....we need your perspective.